Citation Information: J Clin Invest. 2019;129(2):556-568. https://doi.org/10.1172/JCI122083. Long-term acceptance after lung transplantation is associated with induction of Foxp3+ cell–rich BALT. (A) Gross and (B) histological appearance (H&E) of BALB/c lung graft (Tx) at least 30 days after transplantation into an immunosuppressed B6 host. Arrow depicts induced BALT (n = 8). Scale bar: 100 μm. 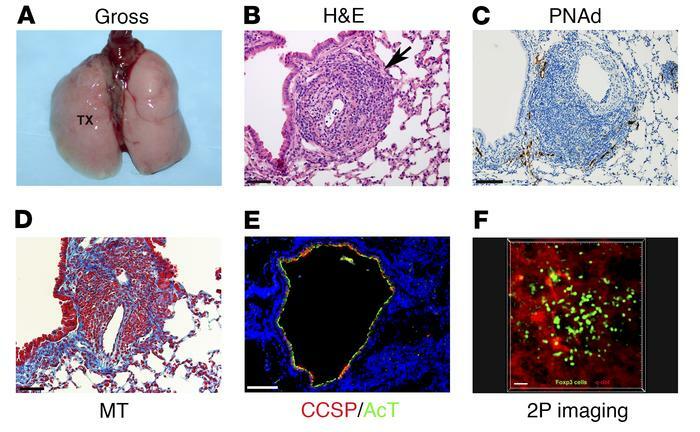 (C) PNAd staining (brown), (D) MT staining (blue), and (E) immunofluorescent staining of CCSP (red) and AcT (green) in BALB/c lung graft at least 30 days after transplantation into an immunosuppressed B6 host. Scale bars: 100 μm. (F) Intravital 2-photon (2P) imaging depicting aggregates of Foxp3+ cells in BALB/c lung graft at least 30 days after transplantation into an immunosuppressed B6 Foxp3-IRES GFP recipient (Foxp3+ cells, green; quantum dot–labeled vessels, red) (n = 3). Scale bar: 30 μm.